WELCOME! Welcome to the of the 7th annual Race for Hope Des Moines! Our event has had a successful six years and we are excited to see everyone again in May! If this is your first time visiting, just scroll through this site for more information. If you are a return guest, we hope this website contains all the info you need to be ready for May 11! We are always working to improve your online experience. If you can’t find any information, please don’t hesitate to contact us using the link above. 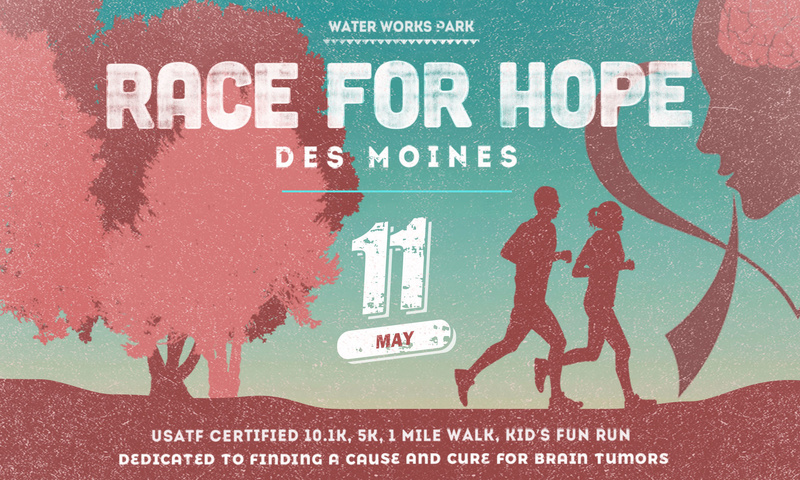 OUR EVENT: The seventh annual Race for Hope DSM on May 11, 2019 will bring together over 1,000 runners, walkers, children, families, businesses, and supporters to Water Works Park in Des Moines for Iowa’s largest brain tumor research community fundraiser. National Brain Tumor Society partners with the world’s leaders in research, public policy and clinical care to advance the understanding of brain tumors, expand the availability of new treatments and drive the discovery of a cure. Dragon Master Foundation works to create a large-scale database of molecular, genetic, clinical and environmental data to assist researchers. By collaborating data, they are able to find trends and similarities to link individuals to clinical trials more quickly and assist researchers in determining potential causes and cure. Children’s Cancer Connection exists to enhance the lives of families affected by childhood cancer by providing quality programs for education, recreation, and support. Have questions? We’re here to help! Contact us today!